The number of condo buildings being erected in Toronto’s downtown core is unprecedented and that is what often makes the news but there is a lot of action happening outside the core! Two large projects include Soul Condos, which will add 250 units on the north side of Fairview Mall. Near Bessarion Station, Concord Park Place will add 724 condos in two towers. But it’s not all high rise condos – a new Mountain Equipment Co-op location is being built on the north side of Bessarion station, along with 50 townhouses. One seven storey building (HCA Architecture Residences) is planned and Liberty Developments is hoping to build a 10 storey building about a block and a half away, but is facing opposition from the city. 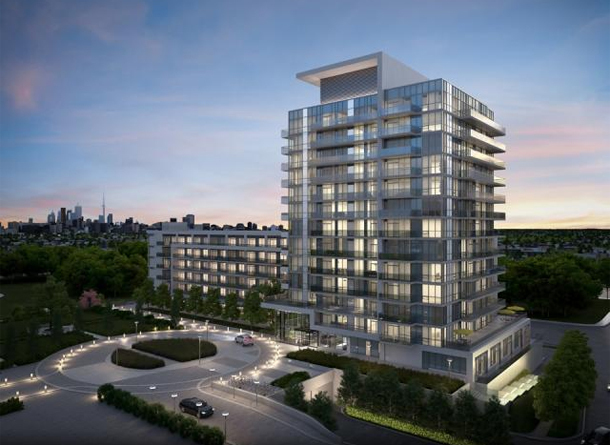 Halfway between Yonge and Bayview at Willowdale, there’s another 7 storey building being pitched by Teeple Architects. It’s called Monocle and I’m wondering if it’s a play on words as it would be built on the site of an optometrists office that’s been there for 25 years. Those developments (and many more) are detailed in a post from UrbanToronto.